This gold egg weighs 3.5 pounds. 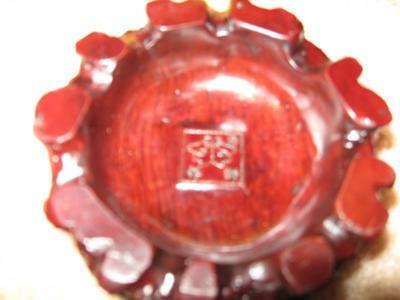 It is gold colored all over with a red felt cloth on the bottom which is flattened, so it can stand. On the back of the egg there are 8 signs. These signs are printed in red. I do not know what language it is written in. Maybe Chinese or Japanese. There are a few maybe 5 tiny like marks or holes (like a dent) on the outside gold and it looks like it is dark colored in these holes. The gold egg is smooth on the outside except for the printing. 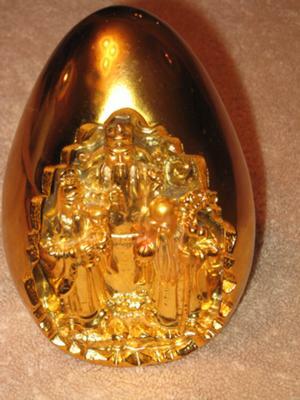 Inside the front part of the gold egg are 3 male figures with beards. Looks like maybe 3 wise men & a child. All have long robes on. One figure with a hat or crown is sitting on a throne or fancy chair & in his left hand he is maybe holding a rod with a snake head. The figure on the left with the head covering of a kind of crown is holding a child. The figure on the right is holding in his left hand a staff with maybe a snake head. This figure looks like it is bald. In his right hand he is holding a big ball that is red on the top only. 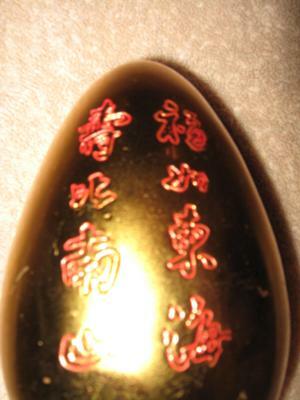 I do not know if the decoration inside the gold egg is molded, or carved. The 4 figures all have black eyes & 3 figures have black eyebrows. The bald headed figure seems to have silver eyebrows. The background behind the figure sitting on the chair is like an open ended swirl design. I have not washed this egg, just wiped it with a clean damp cloth & the gold color has not changed since I have had it. I bought this gold egg at a garage sale for $2.00 about 4 years ago. The gold egg sits on a 1 & 1/2 inch stand that is either highly polished wood, or a plastic of some kind. I am not sure but it may weigh 3/4 of a pound. It has a smooth top & the bottom is flattened bumps. The sides look like raised bubbled lava with indented holes that have a smooth surface inside. There is a mark inside the bottom of the stand that has the same sort of style of printing as the back of the egg. There is also an R in the top right corner with a circle around it. Any help greatly appreciated. Thank-you very much.